Before I rant, and I am afraid you’re in for a bit of a rant (sprinkled with some pictures to soften the blow), I want to thank all of you for the great What-To-Do-With-800-Canning-Rings challenge. Congratulations to Flan who had the idea of using bungee cords. Done and done. Thank you, Flan. I’ll send an email, please send me your mailing address. Jars on the way! And, because subjective judging is so annoying, I promised a randomly selected winner for another pantry giveaway box, congratulations Madeline. I’ll send you some extra rings while I’m at it. Thank you all for the ideas. My neighborhood listserv hooked me up with an art teacher who will take many many rings for her classroom. All’s well that ends well. Alright, warning warning. Here comes the rant. This. An NPR story about a man who canned elk meat and gave himself a good dose of botulism. There are so many things wrong with this story, I hardly know where to start. Why did he use a pressure cooker when he should have used a pressure CANNER? (Or was that bad reporting?) Why he opted to can meat using “his mother’s recipe” but never before had done any canning himself yet did no additional research? Just cut up a wild elk (and who knows how long he took to harvest the whole beast), put it in jars, place those jars in the WRONG equipment and then, rather than follow the instructions, alter to suit, all so his canning was more CONVENIENT? No, he did not listen for the ping indicating a SAFE SEAL, he listened for the ping that indicated a seal had FAILED and then decided to refrigerate and eat that jar? Seriously, what kind of stupid is this? Once I stopped muttering under my breath, it occurred to me I had never addressed all these fears directly. Let’s get it out there and start a conversation. Because, really, there is plenty to fear. But with knowledge comes power, right? The power to preserve intelligently. On the other hand, growing up in Ohio we drove nearly an hour to eat at a small Mexican restaurant near Detroit. They served the most delicious salsa. And that salsa killed 13 diners one night. Improper preservation techniques. This is a story that I tell my preserving students because we could all use a little fear. We should respect that canning is not cooking, it is science. And without respecting the science, you risk making people sick. Here are a few of my rules of the road. There are so many more, so many I take for granted. Chime in below, leave a comment, tell everyone how you ensure safety with your canned products, or tell us what scares you and I’ll try to allay your fears. I want to see everyone preserving, sure, but I want it to be safe to eat, too. Use recipes from trusted sources. My canning knowledge comes from years of experience, plenty of reading, and many many experiments. When I am unsure, there are places to get recipes tested for a reasonable fee. When “adjusting” a recipe, remember No Freewheeling with anything other than swapping sweeteners (by weight), adding or omitting herbs and spices, exchanging vinegars (if they are 5% acidity) and adding small amounts of liquor. I received an email from a reader recently saying a jam had not set to their satisfaction. They questioned the recipe, but when I prodded, admitted to cutting the sugar in half. That is not following the recipe. Of course the jam didn’t set. And shelf stability for a year can’t be guaranteed when you decide to change a ratio. Follow the rules. Read the instructions many times before starting. If you haven’t canned before, get a friend and do it together. Two heads are better than one. Or ask to help a veteran canner and learn by doing. It’s the best way. If you can often, you will develop a rhythm and have a body memory of the process. If you only can once a year, reread the recipes and all the instructions before you get going. There will be things you forget. Give yourself plenty of time. Keep your equipment in top shape. If you pressure can, check the gauge every year. Most hardware store and many auto mechanics will check the gauge for you. The rubber gasket on dial-gauge machines will wear out. Check carefully for rips and tears and replace it when needed. If the jar does not seal, refrigerate it right away and use the product as soon as possible. If an entire canner load fails to seal, the jars can be emptied, reheated, ladled into re-sterilized jars and sealed with new, never used, lids. But if an entire canner load failed, it’s time to review your actions. They should not fail at that rate. Did you remove the air bubbles before sealing the jar? Did you overfill the jars? Did you carefully clean the rim of the jar and all the threads before placing the lid? If waterbath canning, did the boiling water completely cover the jars? Did you use the correct jar size for the recipe? If pressure canning, did the pressure spike? Was there undue siphoning? When you grab a jar from the pantry, if it is no longer sealed, throw it away. Do not taste it. Just toss it. Jar and all. If it is sealed, but there is mold growing in the jar, throw it away. If it smells like something died in the jar, throw it away. Don’t feed it to the dog. Don’t taste a little, just to see. It’s just not worth it. Keep it clean. Everything. Before you start to can, clean all the counters, the sink, the stove. Give the pots and pans a good going over. Sterilize the jars. Finally, let’s agree to be smart about all of this. I give away jars of food all the time with confidence. But would I give home canned meats and other pressure canned and low acid foods to someone with a compromised immune system? Never. Only a person of questionable sanity would choose to can elk as their first project. It’s best to start with pickles or jam, move on to putting crushed tomatoes or tomato puree in a jar, and just as with any new endeavor, warm up and stretch before going for the gold. Last word: This sauce is divine. Peel, pit, and halve the white peaches. Slice each half into four long crescents and place in a largish bowl. Squeeze the lemon juice over the peaches and stir. 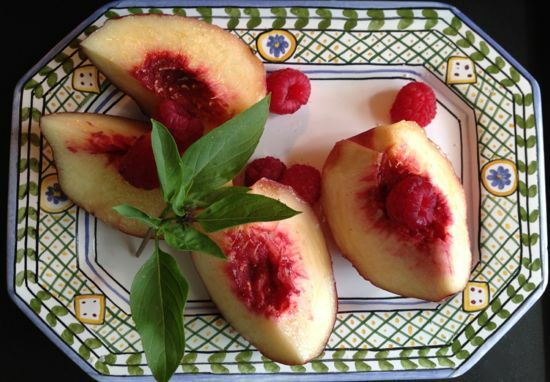 Run the raspberries through a food mill right into the bowl with the peaches. Alternately, press the berries through a fine sieve to remove the seeds. Add the sugar and basil and macerate for 12 to 48 hours. Empty the fruit into a colander placed over your preserving pan (any heavy weight 5 quart pan – Le Creuset is a good choice). Discard the basil. Let the syrup drain into the pot for about 20 minutes. Place the colander into a bowl and hold aside. Clip on a candy thermometer and bring the syrup to 215°F. Add back the peaches and cook until the sauce has thickened, the peaches no longer float on the surface of the syrup, and the foam has cleared, about 25 minutes. Ladle into sterilized 12 ounce jars. Wipe the rim of the jar carefully, place a warmed lid and ring on the jar, “finger tight”. Process 15 minutes in a water bath. For more information on water bath canning, see this post. Slather in layers with pound cake and whipped cream for a fantastic trifle, spoon over crumbled meringues (like this mess from David Lebovitz), stirred into yogurt or ribboned through peach ice cream. 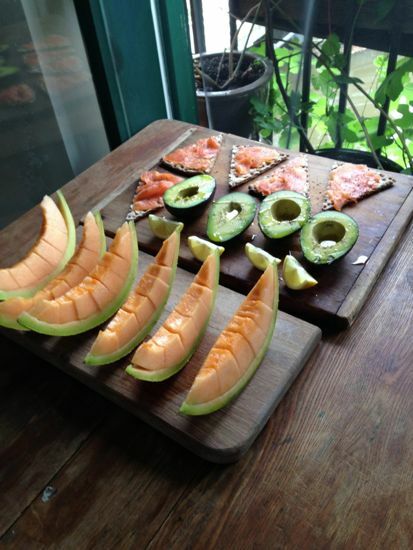 Best midmorning snack EVER. At Canal House. Still here? 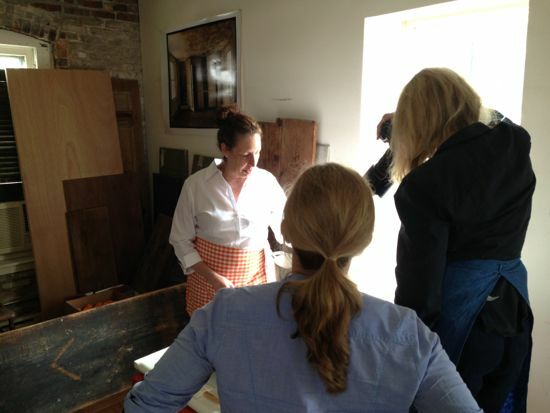 I had to share these two snapshots from my time at Canal House last month. We’ve started photographing The Book. Goodness me, it’s feeling very real. Thanks for those reminders! I had all of my water bath canning materials for well over a year before I got over the fear of making someone sick and actually used them. I’ve now done BBQ sauce, a few kinds of applesauce and other apple foods, pickles, corn relish, mustard and salsa, all successfully. I’m hoping this year to have enough garden yield to do tomatoes. It takes time and patience but the rewards are so great. I bought a pressure canner last year that I have not tried yet – we’ll see how long it takes me! You are a beginning canner. You can (hopefully, with a good source book, like Ball Blue Book) standard things. However, note the “salsa”. That is usually a tomato-based condiment…high acid (use labeled 5% acid) with a few other things thrown in. If those “few other things” are celery, onions, and particularly peppers, you are lowering the native acid content of your product considerably! Salsa with non-acid vegetables must be pressure canned (and you don’t have the equipment yet). Adjusting the product content is a bad thing…don’t do it. There is a wonderful boiling water salsa recipe in Canning for a New Generation! I completely agree in not modifying a recipe just to use it in a pressure cooker, but using a solid tested salsa recipe in a boiling water bath is not always a no. And if the lure of salsa can convince someone to start canning, go for it! I like to use it because I feel much more efficient continuously canning several batches in a boiling water bath than with my pressure canner. (No waiting to get up to pressure, clearing out the air, processing, waiting for it to cool, slowly taking off the lid and letting it sit so it doesn’t siphon….and starting all over again. Boiling water – put in jars, process, let sit 5 min, take out jars, repeat. Not so much downtime and babysitting. Maybe I’d feel differently if I had that monster All American double decker, but I do not. I bow down to you in all your infinite wisdom! Thank you SO much for sharing your knowledge and expertise – you make the best virtual mentor. LOVE the Canal House photos!! A very good and timely rant. (Elk…. Come on now.) It is wise to have a healthy respect for the science of canning. I still stick mostly to jams, pickles, and tomatoes. And I always keep in my head the mantra “When in doubt, throw it out.” Like you said, it’s not worth it. There’s absolutely nothing wrong with canning elk, tuna. or any other meat. Hunters & fishermen need to preserve their bounty somehow. Canning is an effective, shelf-stable, energy efficient way to preserve that meat. There is a serious problem, as this man discovered, with doing it the wrong way. He did it the wrong/lazy way, and nearly died. Jenn, I completely agree. But I did not start out canning with an entire elk to process. I started with jam. Now I can all kinds of meats and fish with a pressure canner and yes, what a marvelous, sustainable and sensible practice. It’s more about expectations. If you don’t expect a firm gel and sturdy jam, and it sounds like you prefer a saucier style, your reductions are probably just fine. If sugar amounts are too slight, the fruit might not keep as long. It will be more likely to turn brown or even mold in the jar. You’ll know. But if it’s molding in the jar, is it OK to eat? Or does it mean that potentially toxic bacteria may also be present? Hi Laura, that’s a complex question. Fermented pickles often develop a little white mold on the surface. In that case, mold is ok, just spoon it out or push it back into the brine where it will dissolve. When I saw mold on a jar of duck confit, I threw the entire jar away. Did not open it. Mold in a jam or fruit jar? Many will remove it and continue to eat the fruit. Some molds are not so bad, others are not good at all. But many food borne pathogens are completely invisible. Mold is not the only sign of food gone bad. Short answer? Use your noggin. If you are going to reduce the sugar, you need to get the special low sugar pectin. It’s made to help the gelling process with less sugar. I don’t like sweet jams either and this is what I do. It comes out fine. Try Pomona Pectin. It is available at many food co-ops, as well as on Amazon. It uses much less sugar, gives recipes that substitute honey or maple syrup, and my jam tastes great! I’m from Metro Detroit and my dad brings out that story every time I start a preservation project. Tell him that you follow trusted guidelines and safe procedures. If he doesn’t want to eat what you can, that’s his choice. But as long as you’re following safe practices, home canning is fine. I’ve been canning, including meats and vegetables, for nearly a decade. Not one bout of illness has occurred. My (then) year-old son ate every last quart of our green beans last winter and I had not one concern that he’d fall ill. Thank you so much for this. I have an organic garden and am going to can tomato sauce and lemon cucumbers this year. My question is this: I see a lot of debate over whether to use a pressure canner or the waterbath method. My neighbor has been canning for years and she invited me over to can with her this year to get the swing of it before attempting it on my own. She only uses the waterbath method because that’s what she and her mother did in Italy. I keep reading about how this method is risky. What are your thoughts on that? I have a waterbath canning set up already but am thinking about getting a pressure canner if the results are better. Thanks for your insight. There is a short answer and a long answer for your question. The long answer will be in my book! Briefly, pressure canning is great for meat, fish, stocks and soups, some salsas and low acid vegetables like peppers, onions, garlic, corn, string beans, beets and field beans. Many canners get along just fine with a waterbath set up. Waterbath canning is not risky if you stick to jams, jellies, vinegar pickles and simple tomato canning. Follow trusted recipes. You’re so lucky to have a neighbor with canning knowledge! Have fun! Thanks for the quick response. It sounds like I should be fine with the tomatoes and cukes but maybe hold off on attempting to can pole beans this year unless I find a reliable recipe or invest in the pressure canner. Thanks again. Just a quick thought on canning tomatoes. We’ve heard that the only sure-fire safe way to can tomatoes is with a pressure canner, because tomatoes simply don’t have enough acid. If you want to use a water bath, you should make sure to add some bottled lemon juice to each jar, or, alternatively, a teaspoon of citric acid (not as easy to find as the lemon juice). The directions specify bottled lemon juice because the Ph level is consistent, whereas the Ph of fresh lemons can vary. Good luck! It’s a hassle, I know, but so worth doing! Amazon has citric acid and it’s cheap! Waterbath canning is safe if your product contains enough acid (for pickles and chutneys and such) or enough sugar and acid (for jams, jellies, preserves, etc). The acid is essential for inhibition of anaerobic bacteria, such as those that cause botulism. The sugar (especially when used for setting pectin) is essential for holding water away from potential bacterial and/or mold growth. This feature of sugar prevents the growth of just about any bacteria. Heat from the water bath kills any living microbes, and spores are unable to sprout if the proper conditions have been provided. According to the FDA, this method is safe for canning fruits or vegetables that are high in acid. If there is any doubt about acidity, then the food is considered to be “acid-added,” and falls under a more restrictive set of procedures (these rules are for commercial food producers, but can and should be adapted for home use. As mentioned in the rant above, good instructions can be found in books on canning, including the Ball Blue Book, and many cookbooks (such as the one from our esteemed author!) For me personally, I only use a water bath, and I only can jams, jellies, and other high acid, relatively safe preparations. I have found that the old recommendations for sugar call for equal amounts of sugar to fruit, by weight. This does not mean cup to cup volume measurement. I had cut the volume of the sugar by half, and got great taste and a good set. However, when I weighed out the sugar and fruit, they were approximately the same. I know that canning, for the beginner, is scary. I have been canning every year for 25 years, and I have a Master’s degree in Microbiology and Biochemistry, so I am quite familiar with the science of food, cooking, and microbial growth. Ugh — I hate stories like the Elk Man’s. Common sense should always rule around food. I thought your rant was spot on and full of good tips. Can’t wait for The Book! 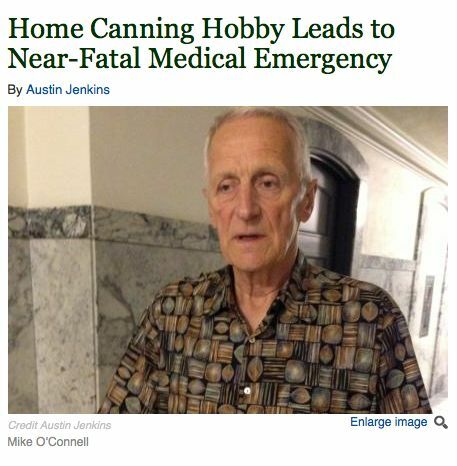 No canner should rely on a journalist’s article for canning advice. This man was lazy. He didn’t follow proper procedures. Maybe he’d canned foods for years with no problems. I don’t have any sympathy for his illness that he caused, and am glad that he didn’t get anyone else sick. Fear is my middle name! This is a great reminder. 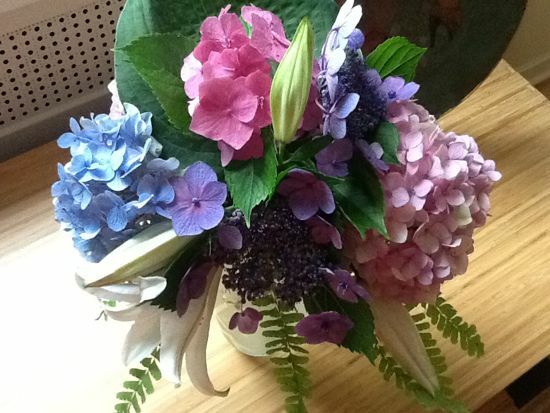 Love your bouquet and the Canal House photos! So exciting…. I have two canning fears… one of the first batches of apricots I ever canned ended up with half the liquid boiling out. Not sure if I put too much liquid to fruit… I know I didn’t get the air bubbles out… but the lids pinged and sealed, and the liquid in the jar covers the fruit completely… the jars are just half empty. I haven’t eaten them (they were canned over a year ago) because I’m afraid that they aren’t good… but don’t want to waste because lets face it… apricots canned in honey syrup… mmm! Any thoughts? Also, my second fear is on freezer jam. My freezer jams didn’t set… like at all… when I thawed them they seperated and are basically just fruit mush. Should they be safe to eat if they have remained frozen for the past year? That loss of liquid is called siphoning and it happens under a few circumstances. The most common problem is not bubbling. Air bubbles rise to the surface of the heating syrup and force air – and liquid – out from under the flat lid. Siphoning happens in the pressure canner if the pressure spikes quickly. In the waterbath canner, a very vigorous boil can also cause some siphoning. Whenever playing with large pieces of fruit, you really need to bubble carefully and pay close attention to the head space. The good news? Those apricots are probably just fine to eat. Jars with less liquid and large amounts of air may oxidize, or discolor, on the surface. And they may mold. Open the jars and eat from them confidently, even if discolored, but if there is visible mold, I would throw it out. Your freezer jams can still be used. Put them in smoothies! Or cook and thicken and serve with yogurt or over ice cream. It’s best to use most home preserved products within a year. Every single person who cans and preserves should have a copy of the USDA Complete Guide to Home Canning, regardless of your level of experience. It is an invaluable resource. Amen. I also recommend the Ball (makers of Mason jars) book. Good thing I learned from the best. 😉 You’ve taught me so much. Hi Susan! I follow your escapades on FB! Hope you are having a nice summer. Thank you, Mrs. Wheelbarrow! Wish I could take a class from you in person! Didn’t know you are working on a book. Look forward to buying it when it’s ready! Maybe I’ll get to your town, Erica! The book comes out next Fall (2014). I enjoy your blog. Always good to be reminded to follow safe canning procedures. I canned salsa verde and strawberry lemonade concentrate today. Great post. Never hurts to review all safety precautions. I’ve been canning off and on for many years and still check my recipes when I start to can them. You may *think* you remember everything but it’s best to be certain. I love your peach Melba sauce recipe but have a question. When do you remove the Thai basil bundle? You don’t mention any more about it after putting it in to the peaches, but I assume you remove it before cooking? I’m growing Thai basil for the first time this year so this will be perfect! Good catch, Katie! Remove the basil after maceration. I’ll make the correction in the recipe. Thank you! Another thing to mention is that you absolutely must adjust your canning times for altitude. I use 5% per 1,000 feet above sea level–so end up adding 30% to my timing. This goes for pressure canners and for hot water bath canners as well. Hi Mary, that’s a great reminder. Thank you for the easy calculation method, too! I grew up canning with my mother and have come back to it in the past few years. I have been doing water bath canning with great success. I have two questions. One, is I made some adjustments to an apple butter recipe. I added bourbon and more apple cider vinegar. I figured since I was increasing the acid, I wouldn’t have to worry. Is that true? Second, I do have a healthy fear of safety and I often end up with different amounts of produce than a recipe calls for. I find the translation can sometimes be difficult esp if the amounts don’t divide or multiply evenly. What is the best way to convert recipes? Is some amount of rounding ok? Should I always round up? Or am I being too worried, and as long as I’m close its ok? And is it only the vinegar levels that really matter? Does the sugar content in pickles affect the acid level? Increasing acidity is always a good thing, but the additional liquid may require longer cooking. In apple butter, that’s a good thing. In some other sauces and jams, it can be an issue. But small amounts really don’t worry me and shouldn’t worry you. Your second question is a good one. Like baking, best results come from weighing your ingredients. And weighing in grams is a certain way to be precise. It takes practice, but it’s so easy once you adjust to using the scale. It’s the certain way to be safe. Vinegar, sugar, salt all contribute to your pickle, but the ratio of vinegar to water is critical, and the percentage of salt in the brine keeps the pickle from spoiling. Do you have a good resource for converting recipes listed in volume to weights? I do always work in weights, when given. But they often aren’t. I never know what a baseline weight for any given ingredient might be, given that measuring styles can effect the volume to weight ratio. Yay! I have a useful comment about how to make easy and accurate conversions: the fabulous Lee Valley Kitchen Calculator. I don’t fully understand how it works (sorry), but it uses specific gravity to convert metric food weights to volume. And if you don’t know the metric weight, it also converts from imperial to metric. AND, it also is handy for quickly figuring out how many teaspoons are in a pint, etc, because it has conversion buttons for those, too. I’ve had mine for four years or so and it’s on its original battery. $18 well spent. Proper head space! My godmother, who taught me to can and was a home-ec teacher in rural Texas, was very particular about headspace. She also cleaned headspace with a clean cup towel that she moistened in the (still very hot) water she boiled the jars in. One wipe, move to a new spot on the towel, new wipe. Kind of like you do with the rim on the communion chalice. Yes, yes yes! Head Space! I LOVE your article! I started out in college as a biochemistry major, then went to cooking school, then moved on to get my degree in restaurant management. But honestly, I’ve ALWAYS been a gardener. I bought a pressure canner a couple of years ago when the number of tomato plants in my garden went over 40. I’m up to three gardens now, and 70 tomato plants….but mostly, learning more about the chemistry of canning has encouraged me to expand and grow more things I can can. This year, it’s tomatillos! Salsa verde for all my friends! But seriously, I always check recipes from trusted sources and rules of canning from the pressure canner company. I love my family and wouldn’t want to lose anyone. Just a side note….a couple of years ago my ex-husband was moving out of the house we used to share and found a couple of jars of 10 year old pickled red cabbage I’d put down. (Yes, of course, I always date my jars.) They. Were. Perfect. Yea me! How do you know how much you can cut the sugar in a recipe. For example, I can applesauce without any sugar and the Ball book supports this as ok, but the Apple Butter recipe in the same book asks for four cups of sugar for four pounds of apples. This makes no sense to me. Do you know why they have the recipes this way? I would much rather have apple flavor than sugar!!! Well, you don’t know, and that’s why you want to look for trusted sources. For the record, regarding apple butter, I have never used any added sugar, but have spiced and reduced applesauce until thickened. Your answer is exactly my point. How do you know who to trust? I checked a canning book out of the library once and it said to use the oven to can. You can do a google search and find all kinds of crazy canning ideas that are equally as stupid as Elk man’s idea. So who do you trust? I hear you, Lisa. Start with the National Center for Home Food Preservation and the Ball Blue Book of Canning. I’m sorry to pester you with the same question but both of the sources you recommended use sugar in the apple butter recipes. How do you KNOW it is ok to not use any sugar? Is there a place to learn more of the science behind what you can do safely? I have been canning for a few years now and I have never found anyone who could answer that question. I have recently started a diet for health reasons that requires me to entirely cut out all white sugar. That screws up my canning! I have found a couple (literally a couple) of jam/jelly recipes that use honey as the sole sweetener, but I am a little unsure what to do in terms of converting sugar in other recipes. I have seen formulas for baking (e.g. “Use half the honey as you would sugar,”) but is that all? How do I safely replace sugar with a different sweetener? If you already have an entry about this, I apologize. Thanks in advance. I was raised in the Ozark Mountains in Arkansas and we stock up by canning. Even so, I attended the Master Food Preservation class out of the Extension Center. You cannot use the recipes that are from old cookbooks because the acidity of the soil has changed. Use a up-to-date canning recipe, and safe canning methods. I wonder how many NA killed themselves when they lived off the land in primitive times? How timely. I did 8 4 oz. jars of sour cherry jam tonight. They are cooling in the kitchen as I type this. It’s only my second attempt at canning and I’m still a bit nervous about it. I don’t know what the ping is supposed to be, but the directions said that the lid should not move if pressed down upon after 12-24 hours. I’m hoping everything was clean enough! 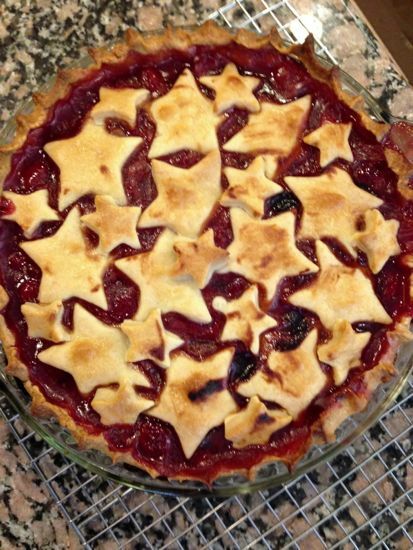 Question…would the jam have set up if I had added some kirsch or almond extract to the mix? I made it in a new small appliance that did all the heating and stirring. The recipe did not call for either citric acid or lemon juice. Just pectin, crushed cherries, and sugar. Interestingly the amount of fruit was listed as …2 and 2/3 cups OR about 2 lbs. I weighed out the cherries as 2 and 2/3 c. just sounded wrong. So…I don’t have any acid in this jam. Is that a bad thing? I put in exactly the amount of sugar called for in the recipe, although I would prefer a less sweet product. Why no citric acid, do you think? I don’t know where you found the recipe and/or instructions, so I have only my own knowledge and experience in answering your question. I have never made a jam or jelly that did not include citric acid or lemon juice. It’s part of the alchemy of gel, as well as keeping the color of the fruit true. I will be interested to hear if the jam has a good set, and if it browns or darkens in three or four months. Even if it is soupy and darkened, it will still be safe to eat, don’t worry. Oh, and yes, add kirsch or extract! About an ounce of liqueur or anywhere from 1/4 to one teaspoon of extract. I bought a device called FreshTech which does the heating and stirring of the jam. The recipe was from the book that came with it. The recipe for Sweet Cherry Jam needed the bottled lemon juice, but with the sour cherry it said to omit it. It came out great! I had some this morning. All the jars sealed tight too. No mold and it set perfectly. We’ll have to see how it does in a few months, but so far so good. Next time I add the kirsch. Btw, does the kirsch take the place of the lemon juice? The kirsch or extract is flavoring. The lemon juice is acidifying. Totally different. You’ll need both. The recipe writer probably assumed that the specified ingredient, “sour” cherries, would provide the necessary acid. Acids taste sour – think vinegar, or lemons – both are very acidic. Sour fruits are likely to be very acidic. However, it wouldn’t hurt to add some citric acid or lemon juice to the recipe. As a natural foods chef I get a lot of questions about canning. I even taught 1 canning class last year and afterwards cancelled the other 2 I’d planned to teach. Amazing the horror stories I heard people tell me about quick ways to can – dishwasher canning? Are your freakin’ joking? I now teach fermentation classes as well as cooking classes. I’ll suggest resources for people to read so they can learn to can on their own. But I just don’t want the responsibility for people’s own stupidity. I’ve heard them all, Elizabeth. Scary, right? I wrestle with this issue as I write The Book – striking the right balance between encouraging and warning. I’ve done a couple jams but that’s about all and I admit, I’m a bit afraid to try much else but I am going to have a surplus of tomatoes this year so I’m considering some canned tomatoes and salsa. Any advice on a safe salsa recipe for a beginner? 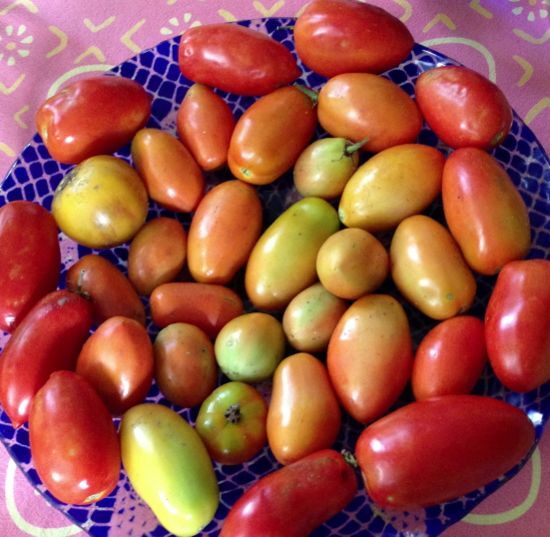 Or are most tomato based recipes acidic enough to be safe? Tomatoes are LOW acid foods and on top of that, garlic and onions are extremely low acid, so the classic salsa combination must be balanced with plenty of acids like vinegar and/or citrus juice. I prefer a pressure canned salsa, to keep the vinegar ratio lower, but some fruit salsas, like chutneys, can be safely waterbath canned. Please use only tested and trusted recipes. Would you have a tested and trusted recipe? I actually have a pH meter so is there a safe pH to shoot for? I admit, pressure canning scares me even more. Never used a pressure canner. The regional extension people for food safety I’ve been learning from here in South Dakota say the readings on a ph meter for home canning with a water bath ought to be 4.6 or lower on the acid-alkaline scale of 1-14. To test a recipe to find out if it is sufficiently acidic to sell at farmer’s markets and the like, they won’t approve a recipe unless it is 4.2 or less. Hope this helps. Fabulous post. You shouldn’t apologize for ranting. I think of it more as “stressing to people in an assertive way” how important it is to preserve foods safely, while backing it up with plenty of easy-to-follow and easy-to-understand advice. You can rant to me anytime. Loved every minute of it. Thanks for the reminder about the rubber gasket in the lids…a frequently overlooked detail because we tend to focus on the dial gauge or whether we have the right amount of weights. PS I think Elk Man meant pressure CANNER. People keep asking me about their dial gauge pressure COOKER and for some reason, many people seem to think that pressure cookers & pressure canners are the same thing. ? If people can’t find a county extension office or a hardware store to test their dial gauges, they can call the manufacturer of their pressure canner. Often they can send it in and have it tested for free, but it will probably cost them postage. I just had mine checked yesterday at the local Ace Hardware, but keep in mind that only one out of 5 people working there knew how to do it, so call first. Btw, this story really hit home. Elk Man’s home town is about 30 miles from where I sit right now. Thank you, Brook! Your support means the world to me. So I have a question..recently started canning and was told not to cover the hars with the water bath so it wouldn’t leak in and risk putting water into the product. Can you tell me why you are supposed to do it? I fear I’m doing it wrong? I’m not sure where you heard that, but please un-hear it! 🙂 The lids are placed on the jars and the rings are tightened over the lids to keep the water out! Submerge the jars in the waterbath in boiling water. When the contents of the jar reach the same temperature as the boiling water (212°F at sea level) the air is forced out of the jar, under the lid (that’s why lids are just finger tight, not cranked on the jar.) If the headspace is correct, the food is shelf-stable now, because there is no air left in the jar! Wonderful post and ranting was needed for this. Especially with new canners come into the market. I am 6 months in to canning and I love it. I trust it 100% and also keep a healthy fear to keep me on track. Two mistakes I have made, one is that I had no idea I was so far above sea level. I never even thought of it and did my first several batches of canning without adjusting for it. Everything seems to have worked out and I still use the stuff I canned but I check it constantly. I also followed what I thought was a trusted recipe and canned blueberries with no sugar. Just the juice from blanching them. Do you think that it a bad idea? No, that’s a perfectly sound idea. Canning fruit in their own juices, sweetened or not, is common practice. However, I hope you added some lemon/citric acid to that? No I didn’t. The recipe didn’t call for it. Sadly, as a few have mentioned above, I have learned that it’s hard to know which is a trusted source. Until we find someone like you, we newbies are left with the world wide web! Regarding preserving without sugar, here are links to a couple of good resources. I tried moderating my sugar a few years back trying to fight off nearly constant yeast infections, and these were the methods I used to can those years. Turned out some yummy products! I’ve been pressure canning for awhile now, and follow the rules like a maniac. Who needs to be a rogue when there are other acceptable ways of preserving things that can’t safely be canned? Anyhoo, do regular folks not can fish or seafood stock? I would really like to put up a lobster stock (I live in Maine and often serve lobster to out of town guests), but I have not found instructions or a recipe for that from a source I trust. Any insight? I make and pressure can fish fume and lobster stock. The recipe will be in my book! Essentially, make your fish or shellfish stock as you would any stock, and pressure can at 10# of pressure (at sea level) for 25 minutes (quarts.) FYI, I find this stock to be shelf stable for about six months, after which it darkens and has less flavor. Love your post! Quick question, when you macerate the peaches for 12 to 48 hours, do you leave it at room temp or are you chilling it? 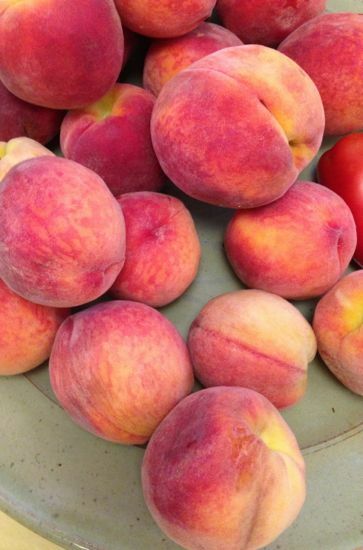 Hi Amy, I will leave the peaches out overnight (12 hours, let’s say) but if I’m not going to come back to them for a day or two, I’ll put it in the refrigerator. They’ll also let you know the current weather forecast of town where the stadium for the game is. Different programs will also bbe providd in NFL games. It obviously affected the clear chronology of real estate routines. game when the time comes to make an offer on real estate.